I really have to give credit to the Dr. Metz on this one, 2 months before we started I couldn't do 4 laps without stopping, he's challenged me far more than any other coach. I wanted to take a moment to thank you again for the wealth of knowledge you shared at the clinic in Boston over the weekend. Hearing from a former educator on some of the less often discussed topics of coaching youth athletes was priceless. It is very easy to write up programs based on science yet it is another animal entirely trying to convey those ideas and teach them to adults let alone children! Your information on these subjects will prove to be an essential part of my coaching philosophy going forward. Thank You Again. Big thanks to Jon Metz and TriVault for the awesome swim camp this weekend!! I learned a lot and i have plenty to work on . The responsiveness and support of the coaches was tremendous. I look forward to training for many future triathlons with them. I want to thank you again for your excellent coaching and especially for taking the extra time to help calm my nerves before the race. It made a big difference. I loved working with Jon and Jen. They gave me the confidence to do things I did not think were possible! Working with the group took me so much farther than training on my own ever could, I was challenged to succeed and with the support of the coaches and team members I did. Thank you so much, Jon! Great information today. I so appreciate you sharing this with our coaches. -Julie Hill, USA Triathlon Webinar Coordinator. Thank you!! You have no idea how much that meant to me when you were at the finish line and there to pick me up so to speak. It meant the world to me for my coach/friend to be there at the end since you have been watching me train and work hard towards my goal. It is nice to know that I DO have it in me which I knew I did but just had to find it, to have a good race and to push myself like I did on Sunday. This beginner triathlon training group was fantastic. It not only met, but EXCEEDED my expectations. I began the program a VERY beginner swimmer, convinced I would never be able swim more than 50 yards straight or any distance in open water; I finished the program having completed the 750 yard open water swim at Tri Dunkirk. TriVault did a great job preparing me for my 1st triathlon. The coaches are knowledgeable and helpful in instruction. 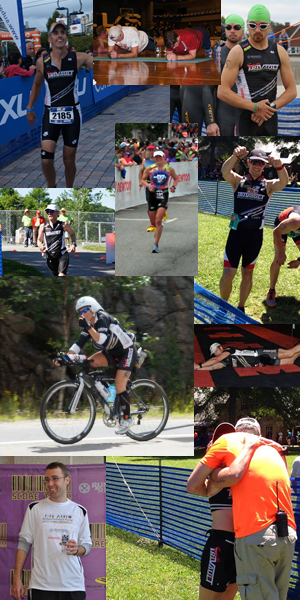 Thanks for the coaching and support at Ironman Lake Placid. Great stuff! I so appreciate how you provide the information with the practical, hands-on information. Terrific job! I would be honored to have you as a coach again next year. Thank you for the swim camp. It was money worth spending. You gave me a lot of tips and hints to go home with and practice. Thank you so much for helping me through 2013...I truly appreciate it. I'm thoroughly enjoying TriFit this winter. The workouts have been very challenging and exactly what I need to get better! I have been working with Coach Jon Metz for just over a year. During this time, I have reached quite a few personal accomplishments. With TriVault's expert coaching staff I ran my best marathon and finished my 3rd Iron distance by taking over an hour off my previous time. Loved the strengthening and assessments. Definitely felt my core strength improve and am enjoying injury-free training! After the winter TriFit program, I felt strong and fit and felt I had a good base going into Triathlon training in the Spring. Jon and Jenny provide an organized, structured program and are both very motivating to their athletes; not only as coaches, but inspiring as accomplished athletes themselves. In fact, as the winter TriFit program was winding down, I even had a new PR at a half marathon I did in February. My time Sunday was 6 minutes faster than I have ever done there. A real good swim without pushing myself, my best bike split by two minutes, and one of my better 10k runs. I know that this is due to the work I put in with you over the winter. I was skeptical of how that program would work for me but really wanted to give it a try. I can definitely say a person would get out of it the effort they put into it. Thank you for the winter workouts and I look forward to growing stronger this summer as we prepare for IMFL. I participate in the TriFit group program and have strengthened my core and balance beyond my expectations. I can honestly say I am at the highest level of fitness, and I look forward to achieving even more! TriFit was a great experience for me. I'm stronger and more focused starting this Tri season than ever before. Jon and Jenny kept the workouts interesting and tough. I'm working on a training program with Trivault, with my coach Jon Metz. It's been really great to see and feel the progress. Keeps me in check. To my Triathlon friends who are trying to improve their swimming: if Jon does another Swim Camp- run, don't walk, to your nearest computer and SIGN UP! So worth it! . TriVault's training group program was a great experience, the whole experience made training something to really look forward to, I would recommend this program to anyone at any level that is interested in triathlon. ©2016 TriVault Inc. All rights reserved.